The top 10 stages of healing after an affair… when you are the unfaithful wife. 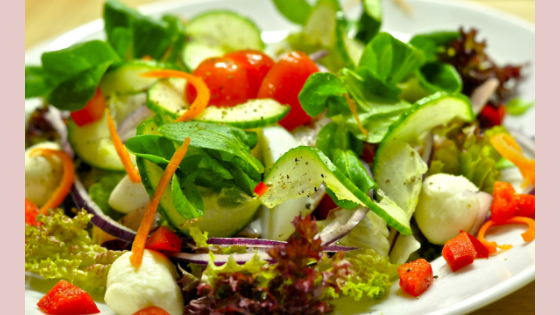 Do you feel confused about what decisions to make because of your affair? Once you read these 10 stages of healing after an affair, you’ll be able to determine where you are today within those stages. Healing and recovery come much faster once we can see clearly where we are and identify the path out to full restoration. Are you confused about what you even want to do? Healing and peace of mind seem like a far off wish? I can identify with the wide range of emotions you might be feeling, sometimes I would have all of them in a single day. (you can read my story here). Sometimes it might seem selfish wanting healing after an affair, when it was OUR affair that caused all this chaos. But hear me well. You do need healing and it’s not selfish to pursue it. You know the saying that you can’t give what you don’t have. No matter where you are today, even if you’re confused about what you want. You can’t be there for your family or help your husband heal if you are a mess inside yourself. Friend, I wasted so much time in confusion, indecision and feeling torn in two inside because I just didn’t know where to begin to heal and start being restored. 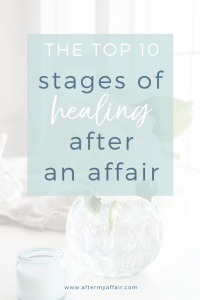 I didn’t understand at the time what the stages of an affair were, and also what the 10 top stages of healing after an affair even looked like. Your first step in getting healing, after your affair, is to recognize where you are in the stages of your affair. STAGES that you might be in right now. Once you honestly know where you are, then we can begin an action plan, to get where you really want your life to be. The top 10 stages of healing after an affair- where are you in this list? I list the actual stage of the affair first, and then explain what the healing process usually looks like at that stage. 1. Thinking about having an affair, but just flirting with a man, ‘no big deal’ you might tell me. an affair or even flirting. It would be wise to identify what that thing is you’re missing in your life now before you cross the line into infidelity). If you are rearranging your schedule to be with a certain person, or taking extra time to look attractive and desirable when you know you’ll be around this person, that is a huge red flag you are approaching a very dangerous place. An affair is never the answer to the void you feel or need to feel desired, it will eventually just make everything worse. Talk to someone about your temptation now, and seek to strengthen your marriage. This is the stage of being secretive and hiding, yet you might also feel a ‘thrill’ in having someone so interested in you. The feelings of being desirable to someone new and wanted can temporarily seem to give you what you’ve been missing. 3. Husband knows about the affair, D-Day has happened, and he’s devastated. Yet, you could also be confused about what to do now about your affair partner and feel quite torn and guilty in hurting him as well. Depending on whether your husband found out by your confession, or he discovered proof of it, can also determine your readiness to ending the affair, although that’s not always the case. Sometimes the unfaithful spouse confesses, thinking that will give them strength to break off the affair, but then find it more difficult to end it. 4. Husband does not know the WHOLE truth about my affair, I left out a lot of details to keep him from getting hurt worse. You’re worried all the time that he will find out more truth about your affair and the details you’ve held back, trying to shield him. Withholding honest information from your spouse will likely backfire later when the chances are high they will discover the truth. 5. Not sure about my decision to stay in my marriage and work it out, or leave my husband for my affair partner. This is the stage of a lot of confusing, mixed feelings. On one hand you want to be with your AP, but on the other you want your marriage to work. If you were to be very honest with yourself, and listen to that small voice inside, you will know the answer. But we often complicate it when our emotions are leading the way. Realize there is a real thing called “affair fog” that happens in the earlier phase of an affair. It’s very nature is to cloud your judgement on what is real and best for you. Your emotions are often running the show in this stage leading to chaos. There is no healing from the affair yet, as you’re actively in it and the your normal reasoning is off. 6. My life is a mess. People know about the affair and I feel so alone. Your infidelity is exposed at this stage, on various levels. You likely have suffered some repercussion from that exposure with rejections, gossip and anger all directed at you, the unfaithful one. It can often be a lonely stage, as sometimes even long time friendships can be severed. People get disillusioned and angry with someone who has committed adultery. It’s hard, but true. Churches are often divided when news like this comes out. Family members may not want to talk to the person caught in infidelity. If you broke it off with your affair partner before, this rejection from others can push you back to your AP, if you’re not careful. The logic is ‘he is the only real person who could possibly understand our bond and connection’. Take extra care right now to find a counselor or trustworthy friend instead. 7. I’ve tried to break it off with my affair partner, but I end up resuming some type of contact again and again. This stage comes from frustration and confusion about why it’s not easier to break it off if he’s so wrong for you. A level of despair often comes after you tried to end the affair but somehow contact with him always resumes again. You’re beginning to wonder if you’ll ever be able to not talk to him ever again. Many Unfaithful wives won’t let themselves walk through this difficult stage of withdrawal from not being with AP, so they contact him again. The result is they begin to lose hope that things will ever change. They sometimes begin to resolve to stay with their AP, even at the thought of it breaking apart their families. 8. I’ve broken off all contact and I really want my marriage to survive this, but where do I begin? You’ve taken the hard road of completely ending the affair and getting rid of anything that links you to the affair partner. You’ve made some tough decisions to do whatever it takes, which is a great step for your marriage to heal. You find the desire to return to the affair partner much less now, but now you’re faced with a broken marriage and not sure if your husband will be able to forgive you. Read my post on 5 ways to help heal your husbands heart after your affair. 9. My husband isn’t sure if he wants to stay married and he doesn’t trust me, but I want our marriage to be restored. This is a scary stage. Just when you’ve started doing all the right things, it looks like it might be too late. Don’t give up! Your husband is likely scared and unsure if you’ll keep your word. His heart has been broken, especially if you previously said it ended, and he found out you were lying again. It’s important to keep doing the right thing everyday and be trustworthy, while showing him compassion for his pain. 10. We are working at healing our marriage after my infidelity, but I sometimes feel like we’re not making enough progress. Is it ever going to get better? It is completely normal to take 2 steps forward and 1 step back in the marriage restoration process. Everyone does. It takes time and consistency in doing the right things every day. It can be depressing if you don’t realize this is what happens to every couple who has had to work through infidelity in their marriage. But it WILL get easier, if you both do the hard work now. You’ll appreciate what you have in a way most couples can’t relate to, once you see what you could have lost. Read my post on marriage rebuilding after infidelity for more ideas. So hold on, it’ll get better. Well, The second half of this post is here, where we’ll explore more about our lives and do we have any say in how its turning out? I’m going to get real with you, asking you what do you want your life to be? These questions may not seem relevant when we’re talking about infidelity, but friend, they really are. Don’t worry, it’s all good. It’s something every person needs to think about and reflect on. What is the life you want to have? I shared that it’s important for you to seek the healing from your affair that you need now. Try not to get stuck in the guilt that wants to keep you from healing. We’ve reviewed the 10 top stages of an affair, and their corresponding stage of healing or mental reasoning during that phase. After reading these top 10 stages of healing after an affair, How can you start the healing process today? What can you do to help your husband heal and begin to trust you again? What did you think of this article, did any of it apply to you? What steps will you take now to begin to get the changes you want to see in your life? You can also read the stages of an affair to get an overview of each stage and that may help you determine which stage you may be in now too. Do you need some encouragement of a real marriage healing after an affair? Read our story here.